See what readers have to say on Amazon.com ! Purchase the book from here. Download the examples from here. The COM and CORBA technologies are often pitted against each other, viewed simply as competing architectures for creating distributed solutions. While the most significant difference between COM and CORBA is their support for different operating system platforms, software developers must realize that each technology has its own strengths that clearly differentiate it from the other. 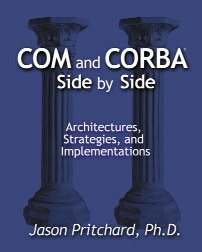 In COM and CORBA® Side by Side, Jason Pritchard objectively describes when and how developers should use both technologies--together or separately--to maximize the success of their designs. This book helps software practitioners analyze and transcend their personal biases toward COM or CORBA so that they may objectively seek the best implementation strategy. The author helps you cut through vendor marketing hype by presenting a clear, logical formula to help you choose between the two technologies. In short, COM and CORBA® Side by Side is an invaluable resource for making informed, critical decisions about using one or both of these technologies in your next project. Other highlights of this book. Explains why COM and CORBA currently hold dominant positions in the marketplace. Describes an objective strategy for assessing the use of the two architectures on the server. Examines emerging server-side technologies such as Microsoft Transaction Server (MTS), Microsoft Message Queueing Services (MSMQ), CORBA-based Object Transaction Service (OTS), and CORBA-based Security Service. Examines client approaches for each technology, including design issues related to remoting and security. Illustrates how COM and CORBA can be used together, with details on both custom and commercial bridging approaches. Examines the impact of Java and Enterprise JavaBeans (EJB) on the COM and CORBA landscapes. For more information, check out the Preface and Table of Contents. Jason Pritchard has extensive experience programming with CORBA and COM. He currently works as a senior architect for CALEB Technologies Corp. (http://www.calebtech.com). As a developer and architectural lead on a multitude of COM- and CORBA-based projects, Dr. Pritchard has become an authority on both technologies and has gained vast insight into their coexistence and interoperability.